After weeks of endless sunshine and blue sky, our weather fortune finally changed in Oregon. It rained. A lot. When it wasn’t raining there was usually a heavy sea fog that blocked any chance of ocean views. We spent a week camping every night in state parks, and waking up to and packing up in the rain was slow, tiring and annoying. 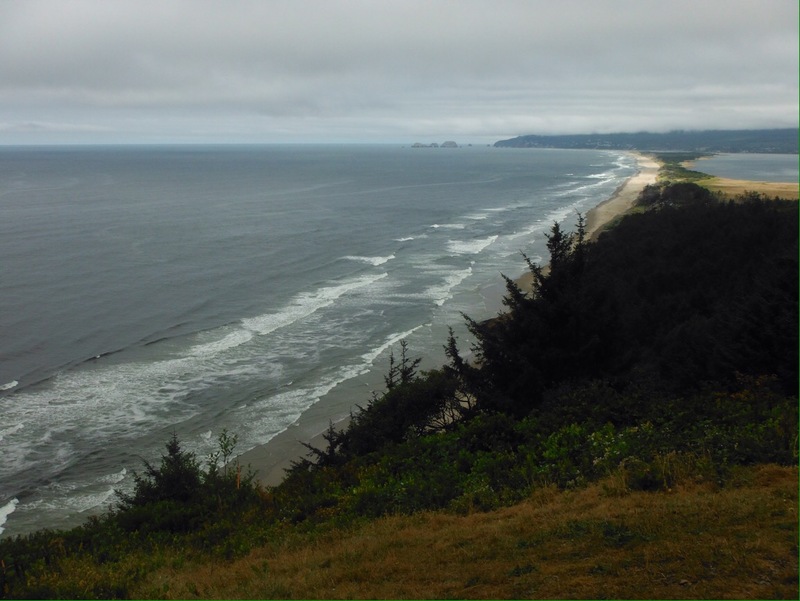 People had been telling us for ages that the Oregon coast was the best bit, with great scenery and camping, and the weather was making this the least enjoyable stretch for us. It reminded us of miserable days in England where it stays grey all day. This was Orengland. We weren’t finding the people as openly friendly either – there are so many cyclists on this route we are just two of many. The towns we rode through were mostly drab, unappealing strips of stores. Add to this an increasingly busy road full of large trucks towing even larger trailers and the cycling blues started to hit a bit. 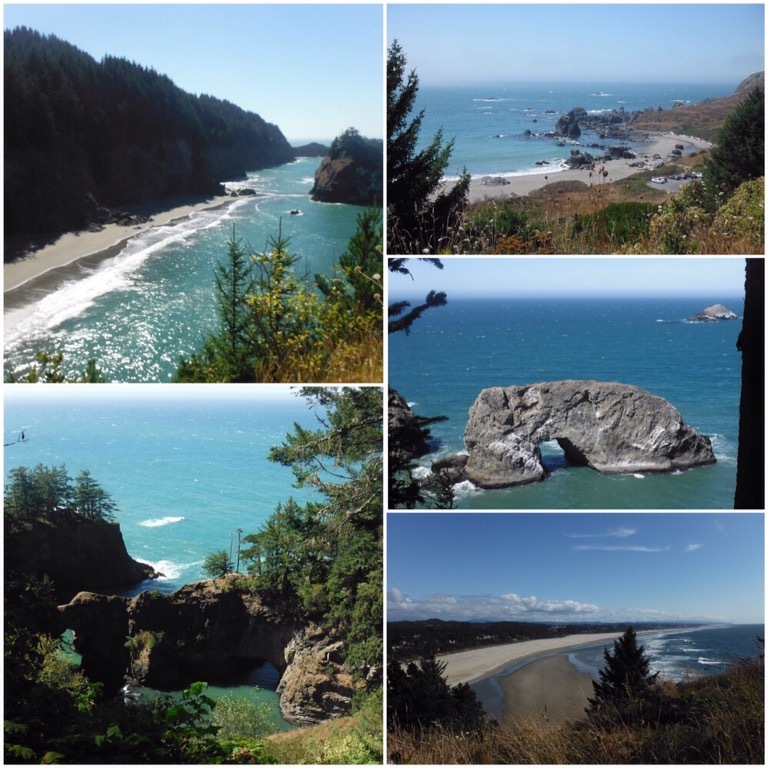 The Oregon coastline is over 350 miles long and quite unique in the USA in that most of it is state owned and therefore publicly accessible. 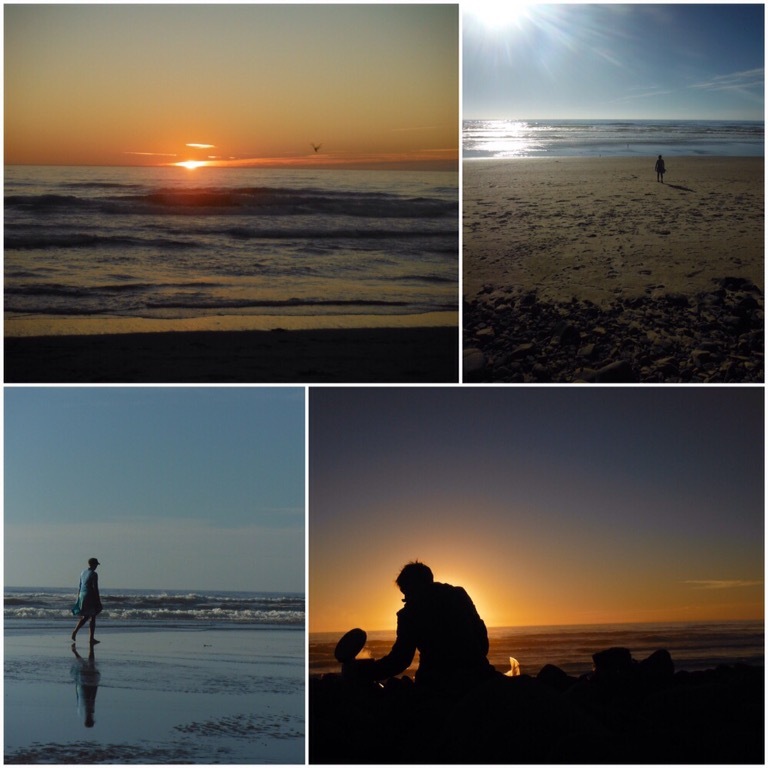 The coastline is dotted with state parks, wide beaches, lighthouses and cliff walks. 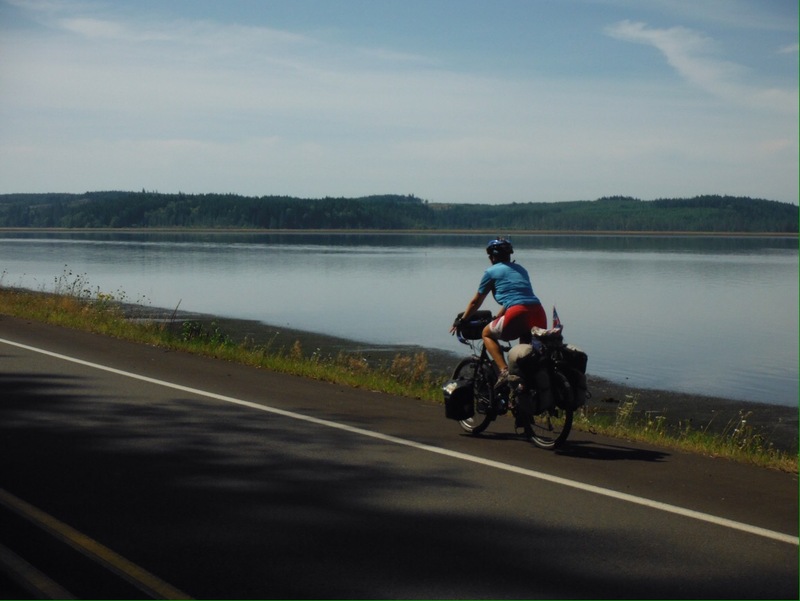 All state parks with camping have specific sites for hikers and bikers at a cheap rate. Again people had raved about how great these are – maybe (likely) the weather impacted our perspective but we weren’t that excited by them as mostly the hiker/biker site is a small and not particularly flat area stuck at the back of the campground furthest from the ocean, the showers and anything else you might need. 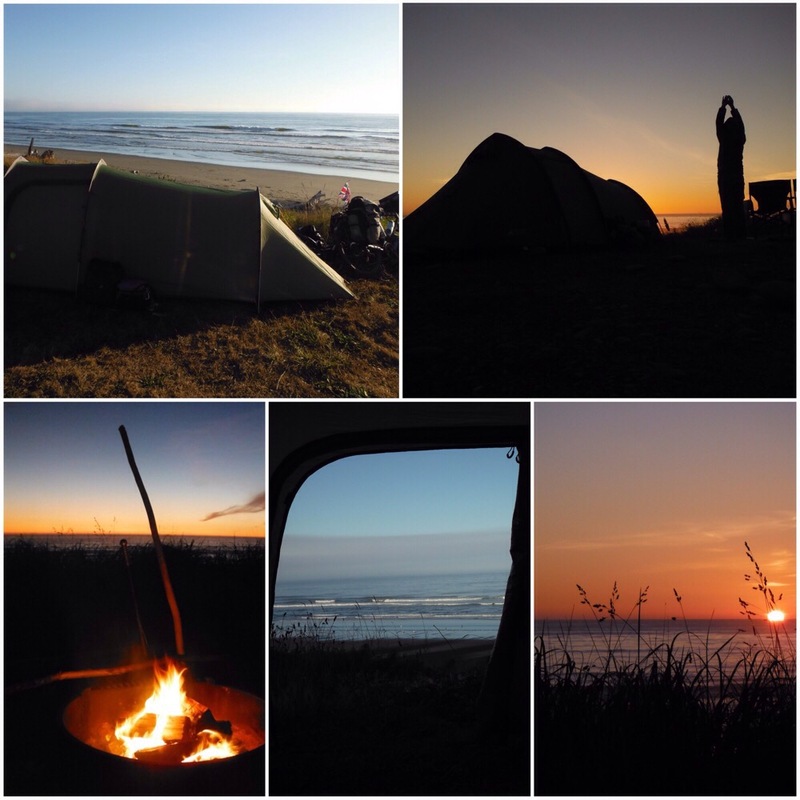 One exception to this was Cape Lookout state park, where we could fall to sleep to the sound of the waves and walk from the back of our biker site to the sea in less than a minute. That evening we cooked dinner on the beach on a rare clear evening as the sun set and Oregon was starting to impress us. 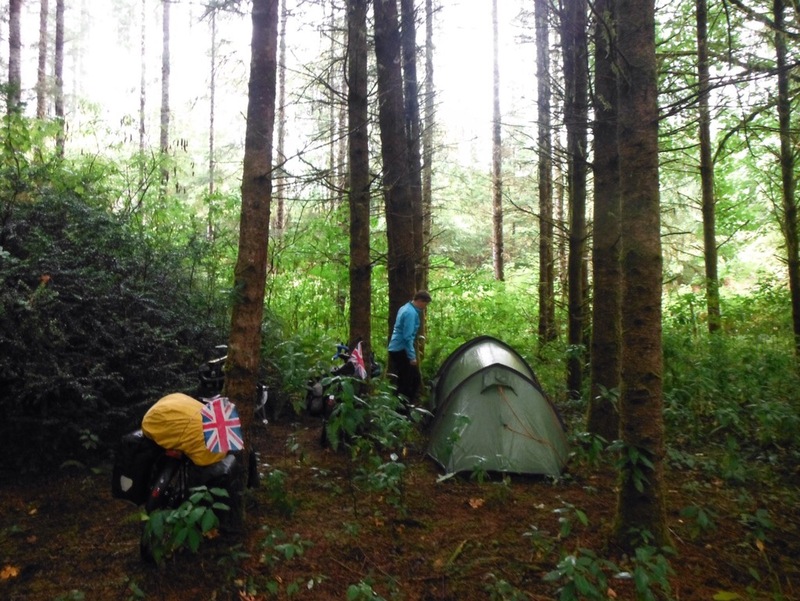 Unfortunately the next morning Orengland was back – the rain was heavy until lunchtime so we hid under a shelter and ate porridge until it slowed enough to pack away and hit the rainy road. 1. There were no campgrounds on our route inland so for the first time we camped in the woods by the side of the road. Unsurprisingly it rained a lot, and we were also woken by a car driving very close to our tent at 2am. It was not the best nights sleep. 2. We ate the best piece of pie in the whole of the USA. Homemade rhubarb pie at Donna’s Low Pass Cafe, if you are ever passing by on Highway 36 in Oregon, comes highly recommended. 3. The total trip computer ticked past 17,000kms. Ace. 4. We spent most of the Saturday watching football (of the American variety) as it was the first day of the college season. By the end of the day we had watched parts of least five matches, and I had probably learnt at least 25% of the rules. 5. 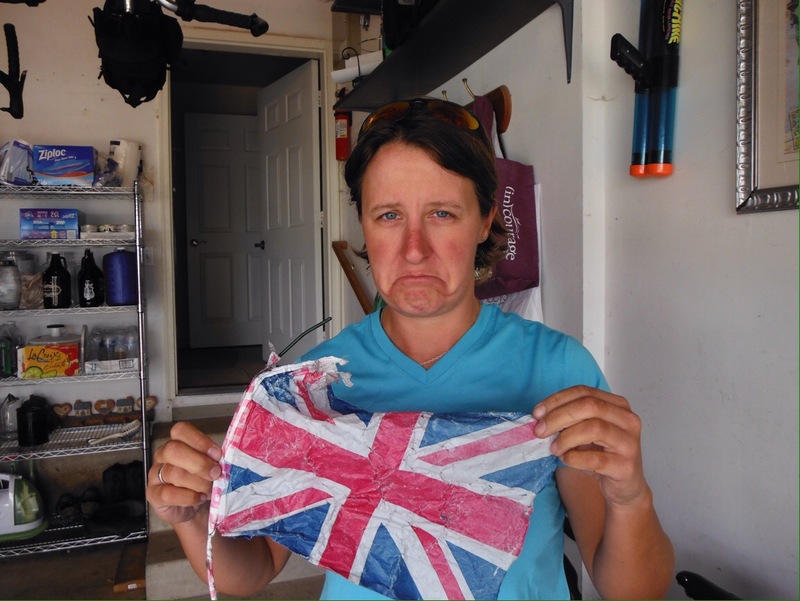 It was finally time for a Changing of the Flags. Our Union Jacks from Boston were looking more tired than we were, which is quite something, so got replaced. 6. Bill cooked us amazing food. Salmon, ribs, waffles for breakfast, you name it…. We ate it. It was very hard to leave. 7. We finally booked our flights out of Los Angeles. Next stop Japan! 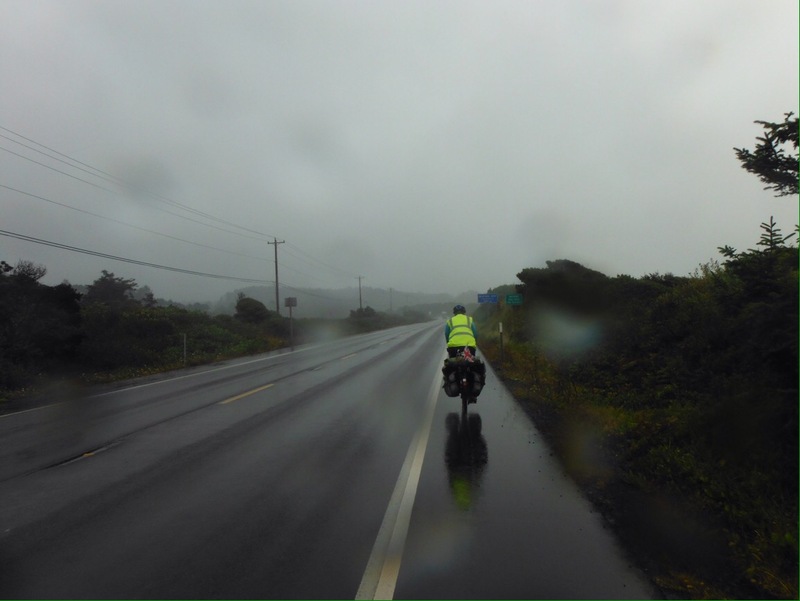 Back on the coast we had another miserable, wet day to Bandon. The highlight was finding a community cafe to dry off in that served a hot lunch with a hot drink for $2 per person. Thankfully we had a host that night so wouldn’t be in the tent, and we kept being told that better weather was coming. Bandon was one of the few appealing towns we rode through on the Oregon coast, and had a nice beachside area and boardwalk. 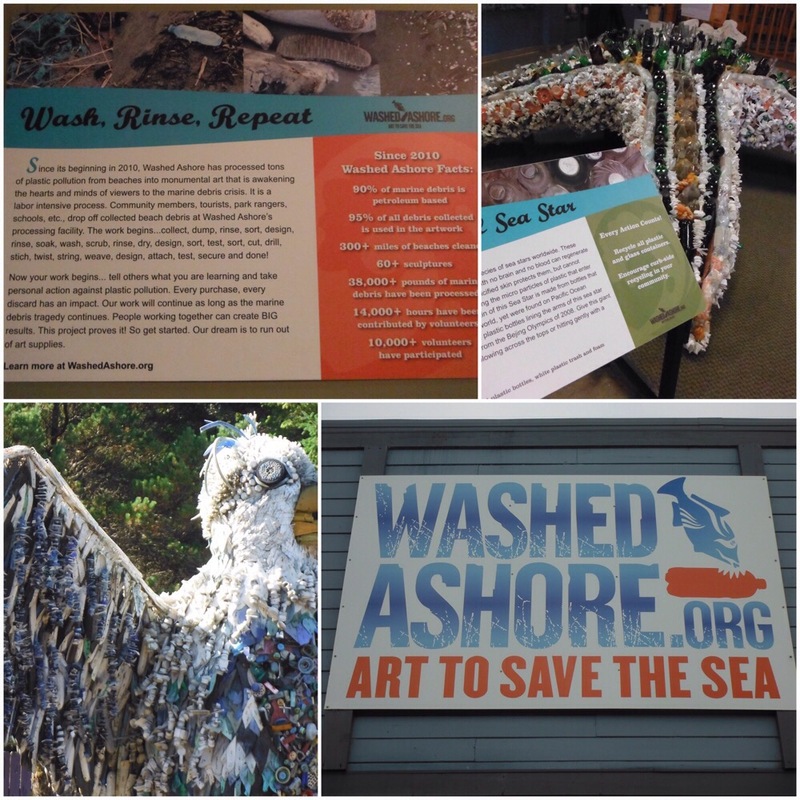 It also had one of the coolest art projects we have seen – a collection of sculptures made using waste washed up on local beaches. Visitors to the gallery can help to make future creations, but unfortunately we didn’t have time to contribute our artistic talent. We also rode past the storage area where waste is kept before being used, and seeing the huge amounts of plastic was very sobering. 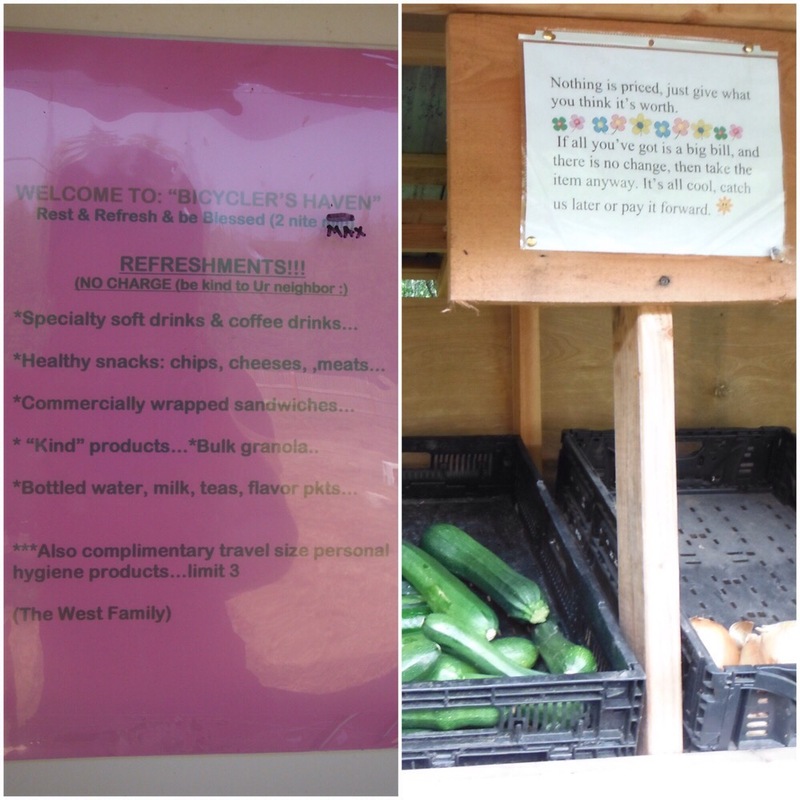 It was good to see the waste being collected and used but sad to see it existing in such volumes. Our last day and a half in Oregon was by far the best riding. The skies cleared just at the right time, as Highway 101 passes through empty, rugged coastline with amazing views of sea stacks, natural arches and coves. Reflecting the bright sunlight, the sea was finally that azure colour that it always seems to be on tourist brochures. We stopped every few miles to sit and watch the crashing waves. The kids were now back at school so the traffic was much lighter. 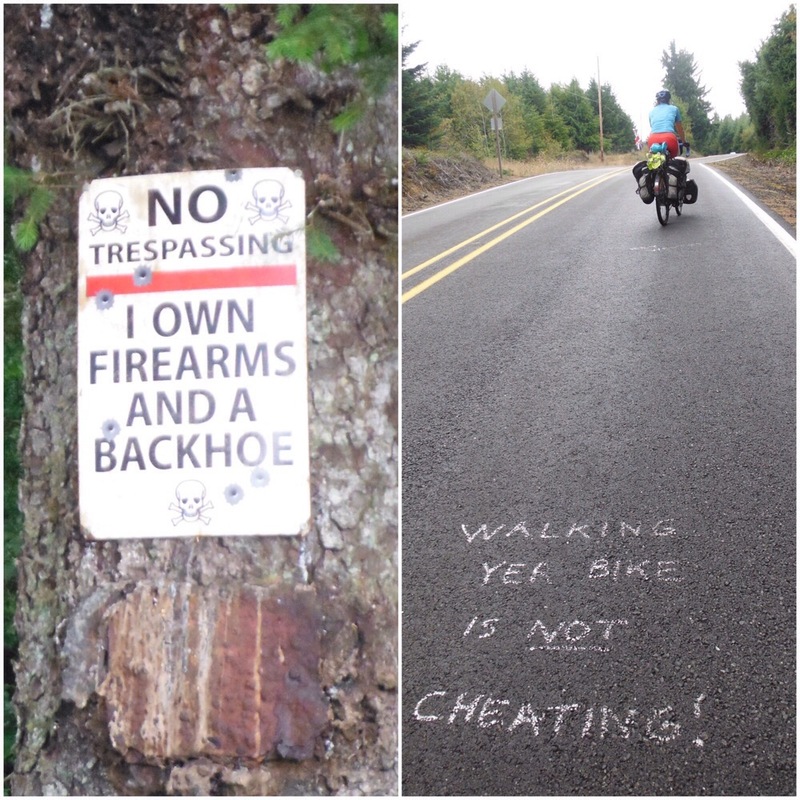 Oregon pretty much redeemed itself in the last 70 or so miles. To add a bit of icing on the cake, on our last night we were down by the marina marvelling at the size of the salmon that had been caught that day. One of the ladies who caught it offered us a piece for dinner – all we had to do was find someone to cook it. As we had already discovered, Americans are not light campers so it wasn’t difficult to find someone with a grill at the campground. Thirty minutes later we were sat eating salmon that had been swimming around in the river just that afternoon. Amazing. Though probably not if you’re vegetarian. Thanks to Bill; John and Kathy; Suzy and Ed; Andrew and Tracy; and the salmon fishers of Gold Beach. 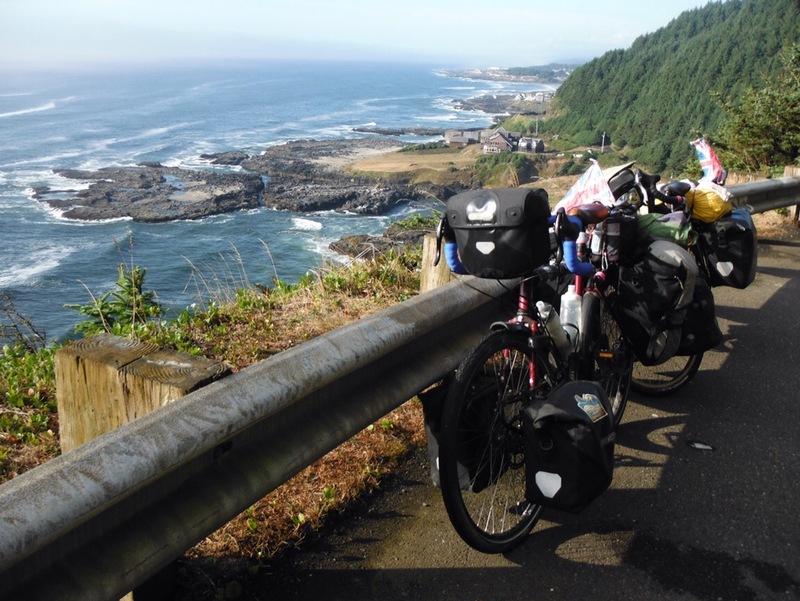 We had crossed North America by bike. So what next? The Pacific Highway (route 101) winds its way down the West coast of the USA, and all across the country people had been telling us how beautiful a drive it was. It’s also a popular cycle route, being a much shorter way (a mere 1800 miles) to cross the country than the East-West route. Six weeks riding by the sea? Ok then. It seemed like a logical next step for us. First we had some friends to catch up with in Vancouver BC, one of our favourite world cities. This coincided nicely with the Olympics, so we had a couple of weeks swapping cycling for sitting watching cycling. The last time we were in Vancouver four years ago it rained pretty much solid the whole time, but this visit we were treated to sunshine so enjoyed all that Vancouver had to offer. 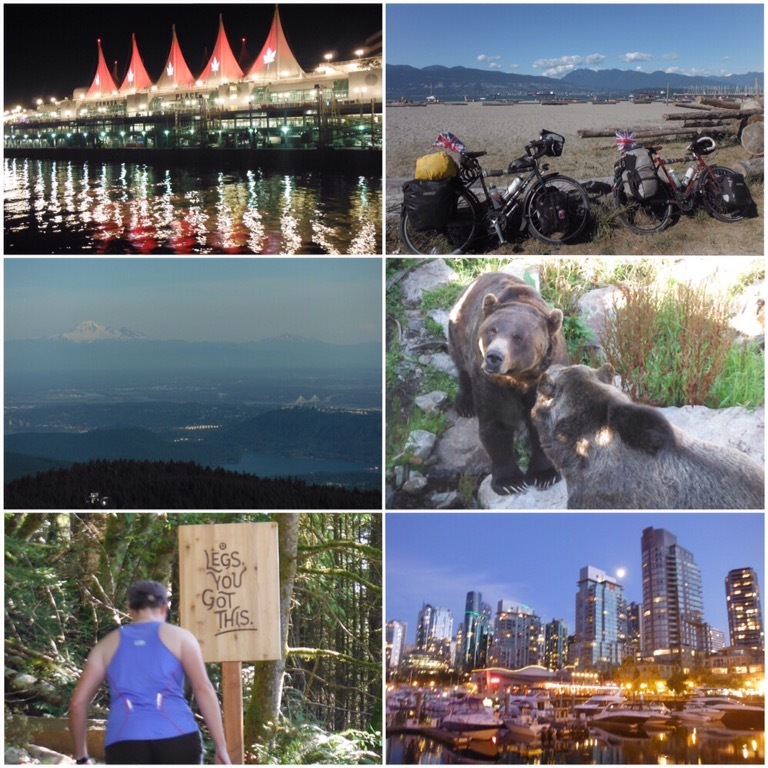 We climbed Grouse Mountain, saw a couple of grizzly bears, made Yorkshire puddings, went to a few different beaches, ate lots of ice cream, took part in a huge water fight… All essential tourist activities. The bikes were away and we barely looked at them. 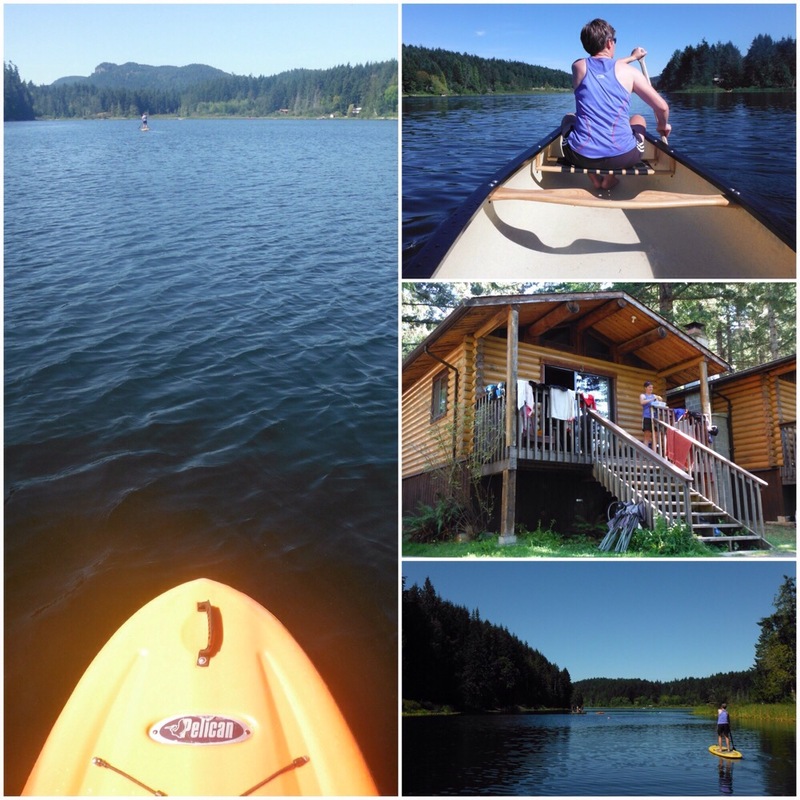 We also spent a few days on Salt Spring Island, right next to a lake perfect for swimming, canoeing, stand up paddle boarding, and relaxing. The sun continued to shine. It was all too perfect, and before we knew it two weeks had passed and it was time to get back on the bikes before we forgot how to pedal. We crossed back into the USA from Vancouver Island, spending the night in Victoria – probably the most British town in British Columbia. There’s red buses and black taxis and everything. The best thing that happened there was nothing to do with British heritage though. Victoria is on the south coast of the island, and we were riding around the headland enjoying views across the sea to the USA when a guy in a car slowed down next to us and shouted that there were some Orcas (also called killer whales but they are actually the largest dolphin) on their way. We raced round to the next viewpoint and there we saw three of them passing by not far of the coast. They are huge! We felt pretty lucky as people who live there told us they had never seen them before. 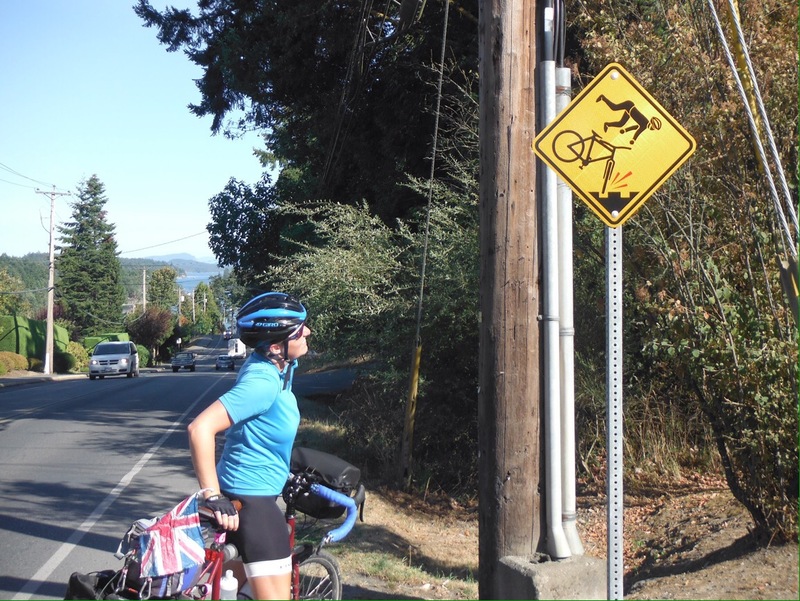 The orcas were too far away to get a good picture, so here’s some killer cyclist sign instead. The next day we packed up and left The Best Place on Earth (British Columbia’s modest tag line) and caught a ferry to Port Angeles on the Olympic peninsula. 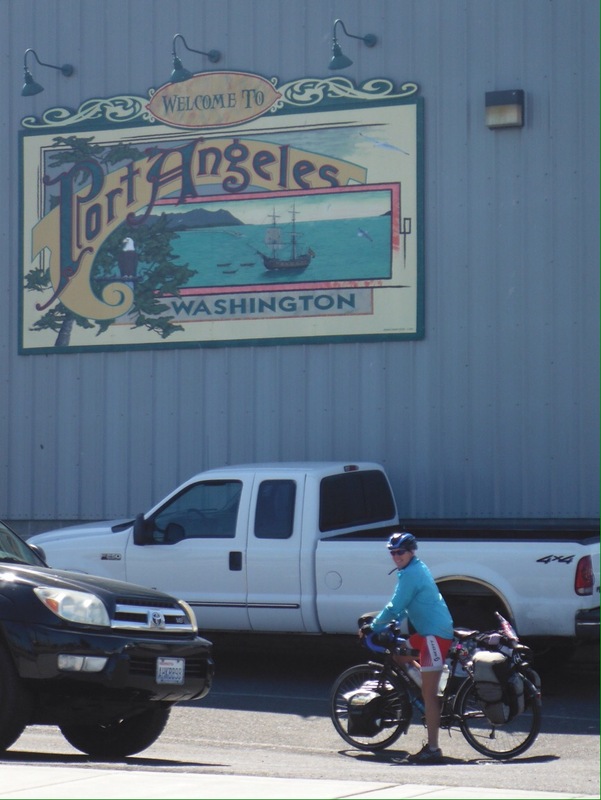 This would mark the start of our west coast trip, ending in Los Angeles – making it an Angeles to Angeles ride. Unlike most ferries, on this one cyclists are treated as foot passengers rather than cars. Good points: no need to queue with cars to get on, no riding down into the car deck, no hanging around breathing in exhaust fumes, nice waiting room to sit in rather than standing out on the dock. Bad point: wheeling a loaded bike through passenger queues. As we had to go through customs and immigration, this was not easy. The low point was trying to manoeuvre them around the maze of bollards while queuing to get into the US. You know when you queue to check in at an airport and it can be quite hard to get your luggage around the corners? Getting a loaded bike around those corners without dropping it or taking out other passengers was quite the challenge. But we made it, and although we were sad to leave Canada and our friends behind, 1800 miles of coastline lay ahead. Pacific Highway 101 starts here and we would mostly follow it all the way to LA. 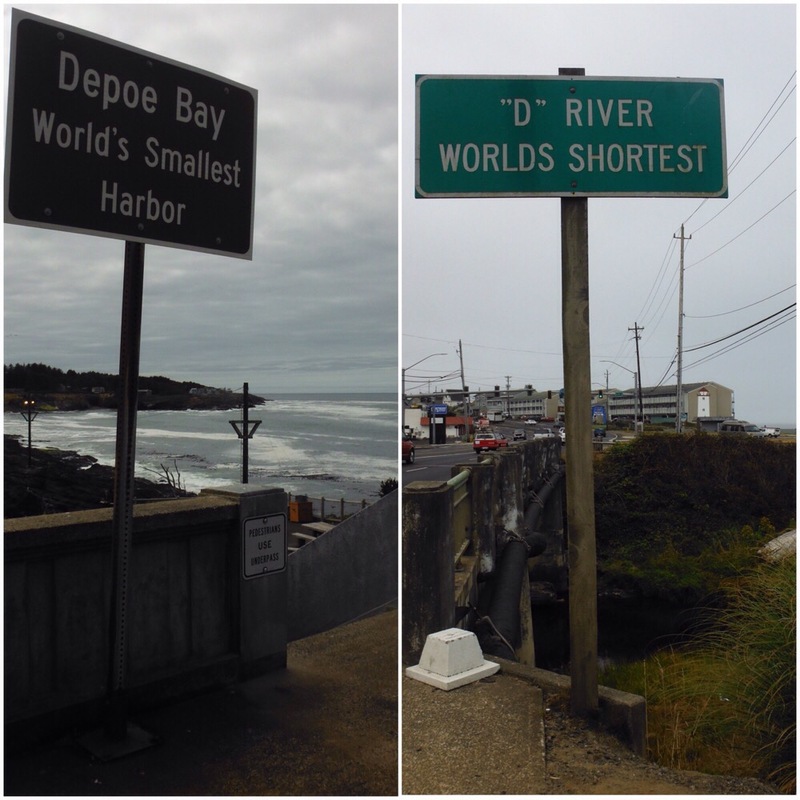 The start of our Highway 101 trip. Next Angeles… Los! 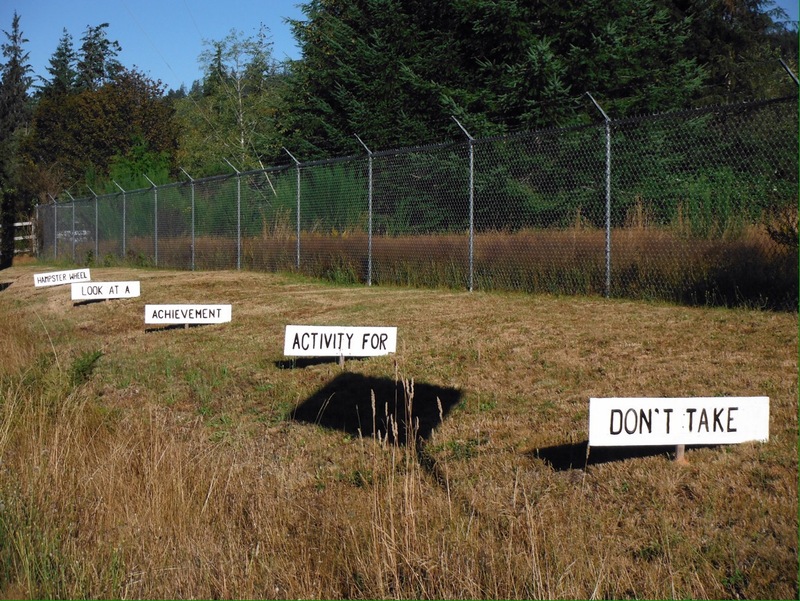 The Olympic Peninsula in Washington state is the most westerly point of the US mainland and has a wild feel to it. The forests are old and huge and the towns few and far between. The only town we passed through on our way to the West coast was Forks, famous for the filming of Twilight and seemingly living purely off this – not much else seemed to be going on. The Olympic National Park goes right up to the coast so we followed 101 in bright sunshine for the afternoon, looking forward to camping overlooking the beach and our first west coast sunset. But just as we approached the coast, we were plunged into thick sea fog. 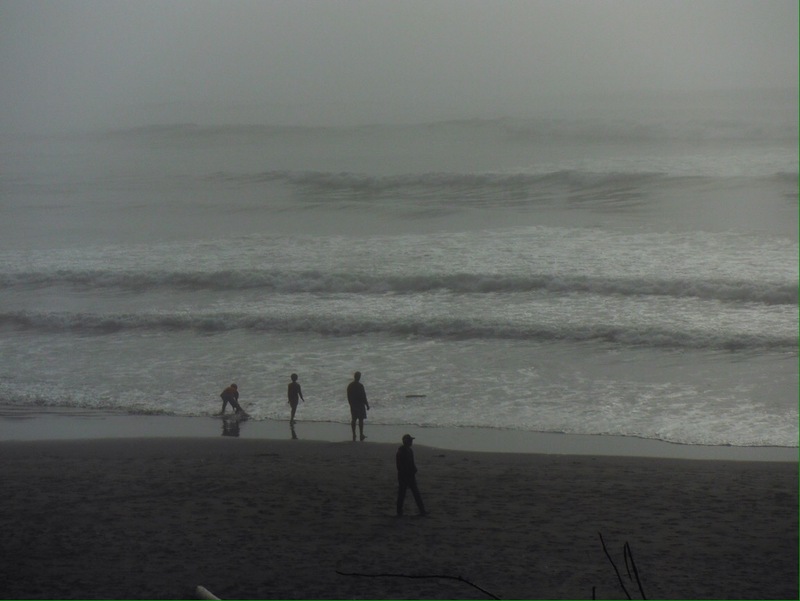 Suddenly it was freezing cold and we were stood overlooking Ruby Beach, one of the most photographed spots on the Olympic Peninsula, and though we could hear the sea, we couldn’t see a thing. 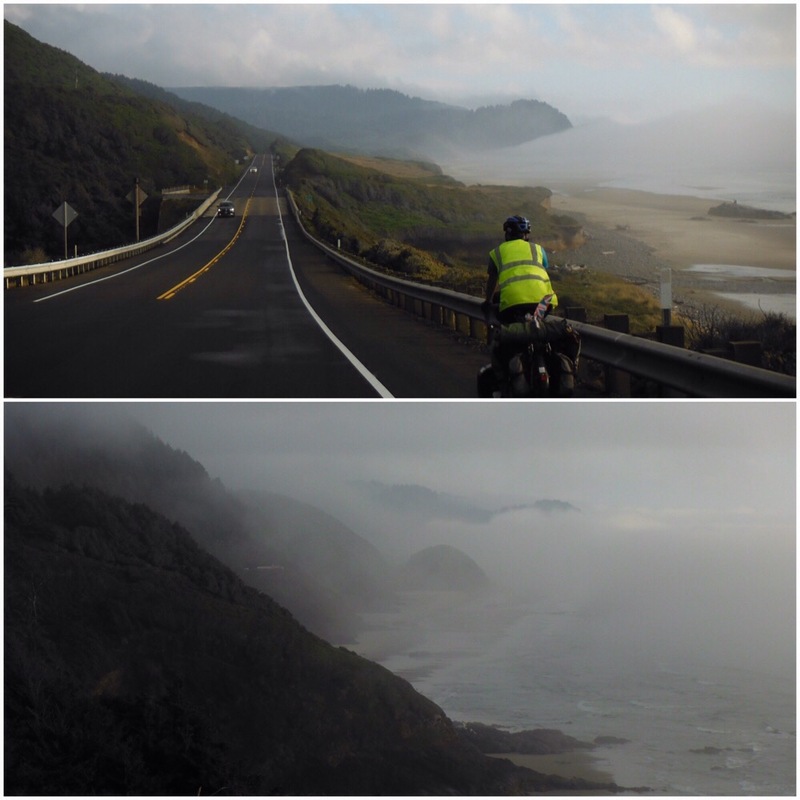 As we rode south down the coastline there was the strange experience of blue sky above the trees to our left, and thick white fog to our right. Arriving at South Beach campground we were offered a spot between two RVs right on the front overlooking the fog/beach. Gradually as we set up camp it cleared and we were treated to the most spectacular sunset over the sea. This is what we had been hoping for! West coast sunset. Hopefully the first of many! For the next couple of days to the Oregon border the road is mostly inland through more forests. One morning we stopped for a huge milkshake on the recommendation of a local. Later that day we were back by the sea again in a popular oyster catching area, so stopped to sample a couple of fresh cooked-in-front-of-you samples. Debs had a hot tijuana (chilli, lime, cilantro, tabasco) and I had the rockafella (parmesan, bacon, breadcrumbs, oregano, basil). Awesome. The day of great food was finished off with a couple of slices of key lime pie as an accompaniment to the first episode of the Great British Bake Off. The next morning our friendly camp neighbours came over to offer us breakfast burritos – we were cooking porridge at the time but we never pass up a food offer, so after a two course breakfast we were full for at least two hours that morning. 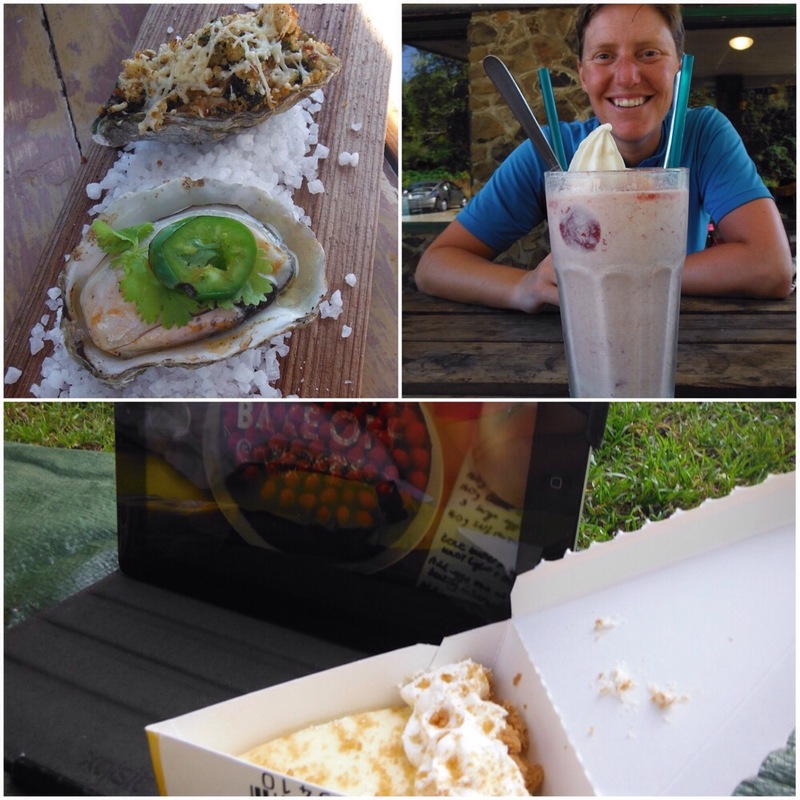 Oysters, milkshake, key lime pie, Great British Bake Off. A good day. Cycling by the water. Whats not to like? 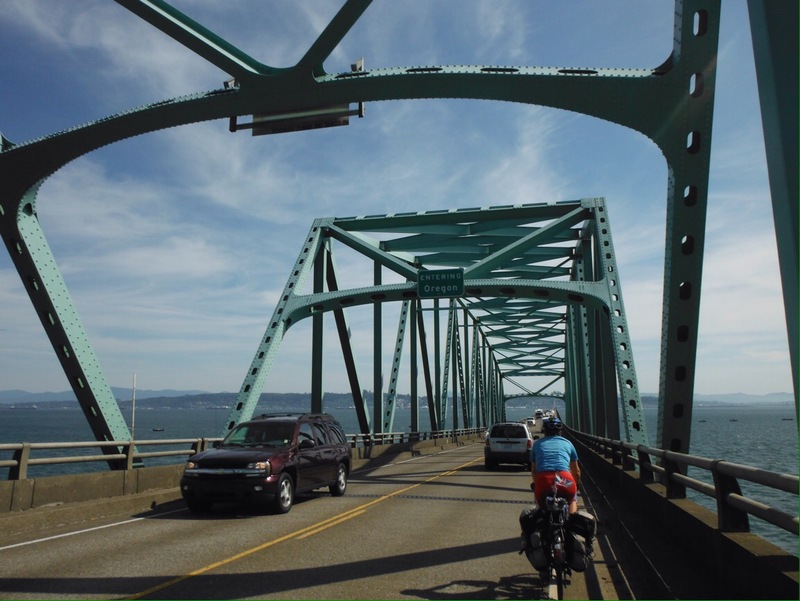 Crossing into Oregon was probably the worst cycling we have done since Naples. 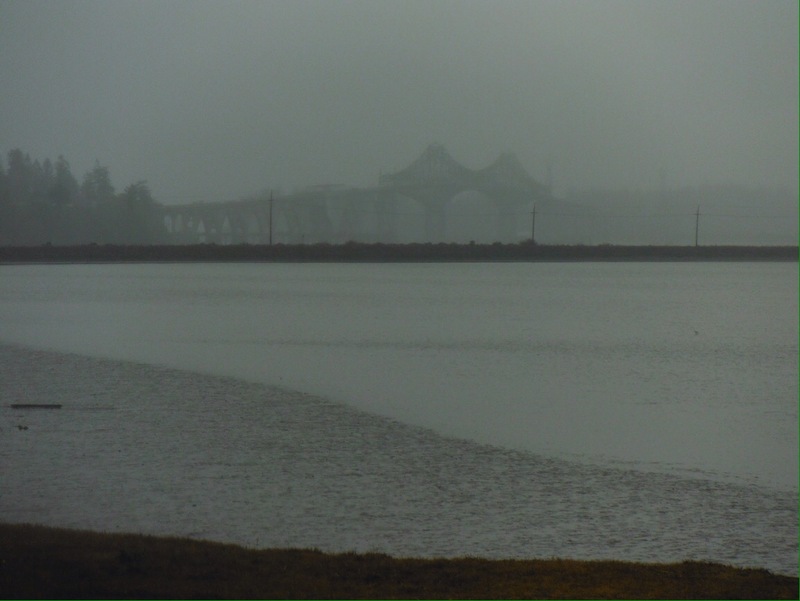 Highway 101 crosses the state border estuary on a narrow 4-mile bridge that was not designed with bikes in mind. The shoulder was about two feet wide, not big enough to ride in easily but big enough to make car drivers think that we should. This is a popular tourist drive, and it was Friday afternoon, so it seemed like every other car was towing either a trailer or a boat – fast. Nobody on their weekend away wanted to be delayed by a bike for a few seconds. Scary stuff. The heavy traffic continued and we were relieved to arrive to the town of Seaside and catch our breath. It had been hot again and I commented to some other cyclists that after a month of hot weather I would quite like a couple of days of cloud cover to stop my skin from frazzling. No prizes for guessing what happened next…. Wise words. Not sure about the spelling though…. Thanks to Andrea and Dave, and Robin, Dane, Riley and Sasha and all of their friends for an amazing holiday in Vancouver; Robin and friends for the great camp spot at South Beach; Marnie and John; Ray and Charlaine; and Neil and Carrie.